This article describes the functions of the main tab when editing a task. Hello there, and welcome back to another rousing round of deconstructing Profit Rhino. Today we're going to briefly go over Editing Tasks. We'll be talking about all the functions of the [Main] tab, which is the primary tab in your task editor. We'll be going over how to add parts, the difference between fixed cost and time/labor calculations, how to add parts to a task, and other miscellaneous items associated with the [Main] tab. First, we'll go over the different description boxes, what they do, and ways to use them to optimal effect. The following image will demonstrate. [Task Name] is pretty self explanatory. It's how your task will be named when searching for it, when presenting it to customers, and when adding to the option boards. [Description] is what will appear below the task name when your technician is searching for the task. It is not the description that will be important for customers. This'll help you get a greater degree of specificity on your task lists. If, for instance, you have two tasks that seem very similar at a glance and normally you'd need to click into them to see what parts they're using to differentiate them, you can instead just look at the small description blurb below the name that may hold the key information you're looking for. [Quick Add] will allow you to designate an item as a miscellaneous item such as a diagnostic or a dispatch fee. This is pretty much only used when creating tasks are aren't stand alone jobs. Obviously a dispatch fee is the best example of that. You don't want your techs to have to sift through your task lists to find the dispatch fee, so instead you have a little drop down list on the quote builder itself. This drop down list will allow you to choose from tasks you've designated using the [Quick Add] function. [Priority] will allow you to specify how "important" this task is as far as sorting option boards is concerned. Essentially, any task that you feel should always be at the top of a list, as in this is the one you really want the customer to see, you want to set as priority number 1. Anything you think is less important and you're fine with being at the bottom, you'd set to priority number 6 and anything in between. Now keep in mind this only comes in to play when sorting option boards. [Marketing Description] is the description you'll be using to wow you're customers when you're building them a quote. Not really. Unless you do some really entertaining plumbing. It is the description that you'll be showing to them when you're describing the job you need to get done though. Additionally, you'll see three check boxes underneath your [Description] box. Value Rate Only, Hidden Task, and Discount Task. Hidden task and Discount task are part of the data import/export process and won't be too important right now. If you have further interest in them, they'll be described more in other articles. Value Rate Only, on the other hand, is a nice function that will set the price of the task to the lowest possible one when added to a quote. If you have a rate that's for special customers, your value rate, this button will allow you to auto include this as a value task. So that covers the four different description boxes at the top of the screen, now we're going to head a little farther down into the [Main] tab and talk about your task/add-on setup. So, just like the lovely image says, we have three main points we'll be talking about. The [Type] drop-down, [Add-On Setup], and [Labor/Assistance Times]. The [Type] box will allow you to determine how you'll be pricing a task. You can use a calculation that will take into account the labor time you enter and the cost of the materials you enter, or you can simply set a fixed/flat price of whatever you'd like. The [Fixed Value] box allows you to provide a fixed value price for the task to be done, which is the kind of a default price for both the task and Addon. The [Fixed Standard] box allows you to enter a standard value price for the task. At that particular cost you may charge extra for more number of assistants, provide more service or anything and fix a price for that task. The [Fixed Premium] will allow you to provide a fixed premium price for the task . In this you can charge for more services at a fixed premium rate. This again depends on amount of service you are providing and decide a premium price for it. The [Add-On Setup] drop-down lets you choose whether or not you want this to ask to be capable of being treated as an Add-On. That concept is explained further in other articles. The [Labor/Assistance Times] boxes are for inserting how much time you think it will take you, or a journeyman accompanying the master, to complete a task. If you're not using a fixed price, changing this value will change the overall price of the task. Most of the above is about preference, and all of it will factor into how your tasks end up being priced. So make sure you've got every task set to your liking by the time you're ready to hit the field. Just a little farther down on that page, we'll come to the [Parts] section. This is the section dedicated to adding parts/material to a task. It'll be important to do when you're not using fixed pricing, because it will factor into the Time/Material calculation from earlier. It also helps to keep stock of the inventory you're using on a particular job. We'll be breaking down the following image. On this list we've got [LN], [QTY], [Part], [Cost], [Sell Price], [Total Cost], [Add Part] and [Total Sell Price]. Seems like a lot to digest, but it's really just a smattering of smaller and more simple concepts grouped together. That being said, lets dive in. [LN] is simply the order your parts will appear on the list of parts associated with a task. So if you have two parts, you can assign one of them the number 1 and the other the number 2. The one that's assigned with the number 1 will show up first on that last. 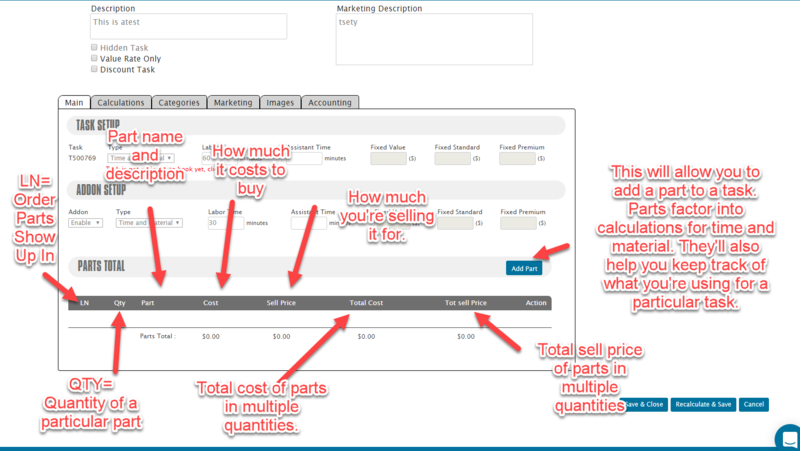 Most people use this to order their parts from most expensive to least expensive for clarity reasons. [QTY] is the number of duplicates you'll have of a particular part. If you need 10 screws, you won't need to add it 10 times. Simply change this value. [Part] will encompass the part's name and description. [Cost] is how much a particular part costs you to purchase. As in the price it'll cost you to purchase it from your supplier. [Sell Price] is how much you'll be selling it to your customer for in-turn. Generally, as I'm sure you know, if you need to provide the parts for your customers you won't be selling them at [Cost]. Most people sell them with a mark-up. [Total Cost] is how much a part is going to cost when you account for the different quantities of said part. So if you have two of one part, it'll so you the total price when you add them together. [Total Sell Price] This is the same as the [Total Cost] except in relation to the [Sell Price] instead of the [Cost] price. Finally, we have the [Add Part] function. This will allow you to search the database and add a part to your task. Doing so, if you have the Time/Material, will increase the price of your task accordingly. This will also help you keep track of the material usage associated with each task. That pretty much covers everything you'll need to know about the parts section of the [Main] tab. The last part we'll be going over is saving your changes and inactivating a task. [Recalculate & Save], and [Cancel] buttons. It's all pretty simple stuff, and most of it pertains to what you'll be doing with a task once you're done editing it. [Inactivate] will allow you to remove a task from the active list. This will stop it from showing up in the mobile, put it in a separate search database, and is useful for temporarily removing a service. For instance, if you're not capable of doing a particular job for the next few weeks, simply remove the task and your techs won't offer it by accident. If you [Inactivate] a task, you'll be able to reactivate it by clicking the same button. [Save & Close] is the button you'll be hitting when you're done editing your task entirely. Clicking this will save all the changes you've made to the task and then return you to the task tab. [Recalculate & Save] is the button you'll hit when you've altered values that will change price calculations and you want to see how they'll effect the task price. For instance, if you increase the labor time associated with a task, you won't see the result until you hit this button. This button will also save all changes you've made to a task. And last but not least, [Cancel] will nullify any changes you've made to a task since your last save and return you to the task tab. If you've managed to make it all the way through this article, you should have a pretty strong grip on all the functions available to you on the [Main] tab when editing a task. I encourage you to refer back to this as often as needed when you finish your administrative training with your on boarding specialist. Good luck.